It was a fantastic goal. In the 39′ minute, Arne Maier, Ondrej Duda and Marko Grujic combined to produce what has been perhaps the goal of the season for the club from the capital. Ultimately, Liverpool loanee Marko Grujic capitalised and made it 1-1 against Schalke on matchday 19. The game would finish 2-2, but much of the attention was on that first Hertha goal scored by the 22-year-old Serbian midfielder. “We had years in which we didn’t score a single,” counter-attacking goal Hertha head coach Pal Dardai would later say about the goal. Indeed, the 13 seconds before the goal were straight out of the coaching manual, throw in Valentino Lazaro, to Ondrej Duda, to Grujic, to Arne Maier back to Duda, he backheeled the ball, in what was a stunning pass, to Marko Grujic, who finished the attacking move with a fantastic goal. “The way the boys have executed this attack, you can’t defend that, it was the goal of the century for Hertha,” Dardai was almost ecstatic about the attack. Right in the middle of the attack was Liverpool loanee Marko Grujic, who has been fantastic for Hertha this season. Hertha signed Grujic this summer on a one-year loan deal, and the Serbian midfielder has not lost a game with the club from the capital when on the pitch. 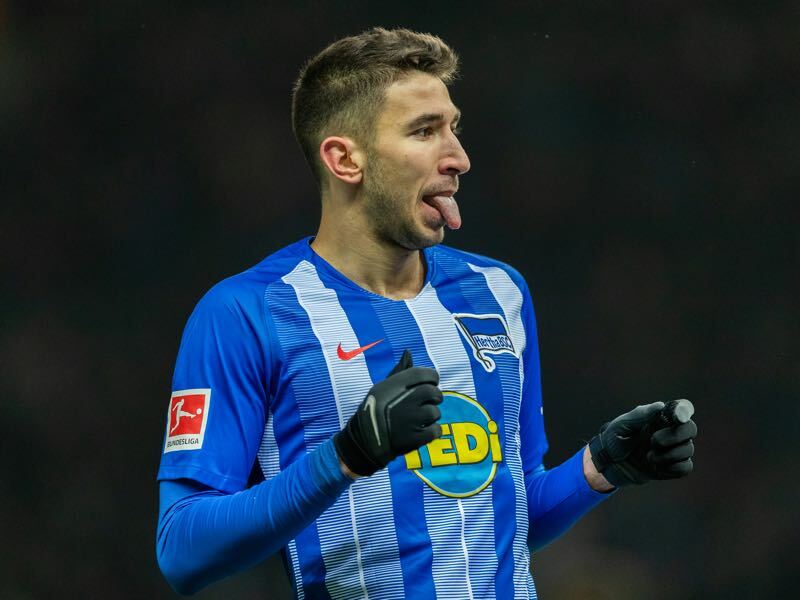 In the nine Bundesliga games, Marko Grujic was involved in Hertha collected 2.33 points on average underlining the midfielder’s importance for Berlin’s Old Lady. With Hertha in the starting XI, Hertha have collected 21 points in nine games. And without him in the starting XI. Just seven points in 10 games for an average of just 0.7 points per game without the Serbian in the squad. In other words, Marko Grujic is an impact player. Someone, who can make the difference for Hertha this season and thanks to his contribution Hertha are currently in seventh place in the Bundesliga with 28 points — even on points with sixth-place Hoffenheim and just three points behind fifth-place Eintracht Frankfurt. Taking a closer look at Grujic’s numbers highlights his value for Hertha. The Serbian midfielder has a strong presence in Hertha’s midfield and is comfortable in the various midfield configurations that Dardai likes to use at Hertha — the Hertha coach has employed a 3-5-2, 4-4-2 diamond and 4-2-3-1 formation this season. Against Schalke on Saturday Hertha started in a 3-5-2 formation in which Marko Grujic was employed as the right-central midfielder. Acting in concert with Hertha talent Maier Marko Grujic played one of the dynamic number eight roles in midfield that both gave him defensive tasks but also allowed him to roam forward like it was the case in the goal he scored. Overall, playing as a number eight suits Marko Grujic the best. He is both an accurate passer; he has completed 84.8% of his on average 38.3 passes per 90 minutes and a good dribbler, Grujic managed to complete 84.5% of his on average 3.29 dribble attempts per 90 minutes this season. What is next for Marko Grujic? With those numbers in mind, it is no surprise that Hertha would love to keep Marko Grujic for at least one more year. For Marko Grujic the future is clear. “I am under contract until 2023 and long-term I want to be an important first-team player at Liverpool,” Marko Grujic said in an interview with the Berlin-based Berliner Zeitung in December. At the same time, he also added that he feels comfortable in Berlin and would not mind staying with the club for an additional year should LFC look to loan out the player once again. “I have time. Another year at Hertha would be good for me. But I am not making the decisions on own,” Marko Grujic said in the interview. “I think that we will sit down next season and make a decision in that regard,” Grujic concluded. What that decision will look like remains to be seen. Liverpool have plenty of options in midfield, and there have been suggestions from England that the Reds could be looking to cash in on the midfielder rather than bringing him back to Merseyside. Liverpool paid €7 million when they signed him from Crvena zvezda in January 2016 but immediately recuperated €1 million when sending him back on loan one day later. In January 2018 Marko Grujic also spent half a season out on loan at Cardiff City. After joining Liverpool, his Transfermarkt value rose from €3 million to €5 million. That value has increased to €12 million since joining Hertha last summer and is considered the baseline for any negotiations for clubs looking to sign the midfielder from the Reds on a permanent transfer should Liverpool chose to sell the midfielder. “I have been here for 22 years. I don’t want to offend anyone, but in that timeframe, Grujic has been the best midfielder that I have seen at Hertha,” Dardai said to the media in December. In that timeframe, Hertha was the home to prominent midfielders like Stefan Beinlich, Marcelinho Sebastian Deisler, Kevin-Prince Boateng and Dardai himself. With this in mind, could Hertha be a possible suitor for a full-time transfer? It appears both the club and the player would be willing, but ultimately it remains to be seen whether Hertha can meet the demands set by Liverpool, or whether the Reds are truly interested in selling a midfielder, who is turning heads in Germany.